Is a Wave of GMP Exports in Our Future? China today, according to our recent studies, is actively growing its domestic industry, not only to support its huge domestic demand for high quality therapeutics, but also to develop an export market capability. The industry is making progress with substantial investments in equipment, quality management, and staffing. China’s bio-processing capabilities have grown quickly and substantively in the past decade as shown by the study and analysis published in the Top 60 Biopharmaceutical Facilities in China, 2017. It’s been a long road, beginning with China’s ‘open-door’ policies in the 1980s, and membership in the WTO in 2002; but China’s recent and rapid expansion into high-tech biopharma manufacturing suggests a future that will involve exports of biologics to Western markets. Even before it became the world’s source of toys, and electronics, China had been animportant exporter of Active Pharmaceutical Ingredients (APIs) for chemical drugs. But the domestic biopharmaceutical industry has been lagging behind in exports, especially to regulated markets. Nearly a decade ago when Bioplan first published its Top 60 Directory of China Biopharmaceutical companies, the results showed a picture of a low(er) quality manufacturing environment for bio-generic products, intended almost exclusively for its domestic market. This scenario is changing, and a recently published second edition of the Top 60 Biopharmaceutical Facilities in China (2017 ed) shows signs that China likely has potential to play a more significant role in GMP exports of biopharmaceutical products over the next couple decades. Currently China exports five categories of biopharmaceutical products including bio-chemicals, recombinant insulin, blood products and therapeutic antibodies, vaccines, as well as EPO. According to Medicine Economic Reporter, in 2015 China imported US$6.1 billion worth of biologics from overseas, which translates to 23.8 per cent growth over 2014. On the other hand, China exported US$2.7 billion of biologics in 2015, a 4.07 per cent growth over 2014. In the first half of 2015, China imported 32 different biologics, among which 71.6 per cent were blood products and immune products (Us$950 million in mAb). The China Chamber of Commerce for Export and Import of Medicine and Health Products states China exported biologics to 174 countries in 2015, with 34 per cent of exports going to Asian countries (Guo Xiaodan). 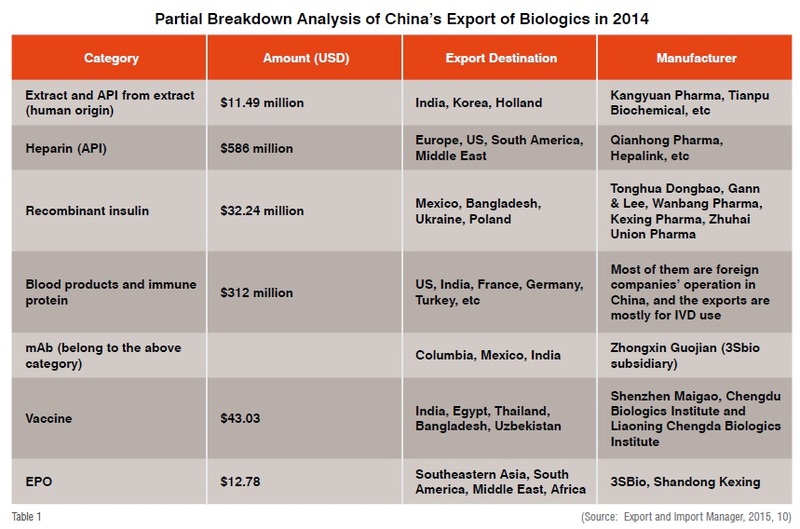 From this analysis, China exports API of biologics to EU or US (such as heparin), while finished biologics products are exported to developing countries. Currently, no finished biologics or biosimilar products from China have been approved in the EU or US. Though some biopharmaceutical products posted double-digit export growth in recent years, overall exports are only a fraction of what China imports in biopharmaceutical products. The deficit may be explained by the fact that China imports value-added products such as monoclonal antibody therapeutics from Western countries while made-in-China biopharmaceutical exports are geared toward lower-end markets. Despite the fact that current export of biopharmaceuticals start from a quite low baseline in China, the industry is making progress with substantial investments in equipment, quality management, and staffing. It is actively attracting industry talent from developed countries. China’s bio-processing capabilities have grown quickly and substantively in the past decade as shown by the study and analysis published in the Top 60 Biopharmaceutical Facilities in China, 2017. Many of the facilities under expansion have plans to incorporate some of the most advanced technologies, including modern Single-use Technologies (SUT), and modular strategies. For example, on June 28th, 2016 Pfizer China broke ground for its first biologics production facility in China, which is fully based upon GE’s modular factory platform. According to a Pfizer press release, the new centre will feature GE’s single-use technology in a KUBioTM modular facility. JHL Biotech, the biologics CMO founded by veterans from Genentech, also attributes the fast-track opening of its Wuhan base to the KUBio modular factory. “The new contract manufacturing base is able to kick off official operation in only 18 months, while the process to reach GMP production may take more than 2 years for a similar company without Kubio’s support”, stated Dr. Cui from JHL Biotech. 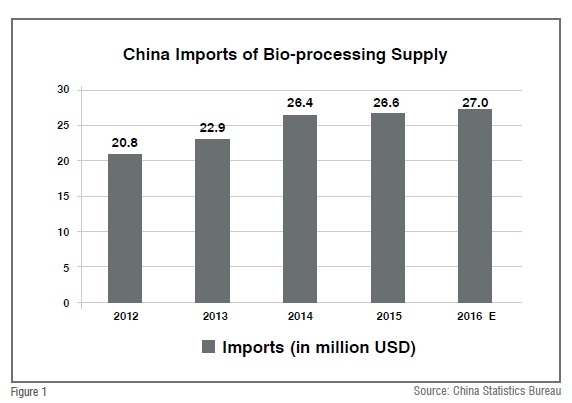 The trend in adopting more advanced bio-processing technologies is consistent with statistics of China’s imports of bio-processing supply (from multinational vendors), which grows quickly during the past several years. Regulatory authorities in China are also making efforts to help the industry develop GMP capabilities. China’s CFDA promulgated new GMP regulations which became effective in 2011.In April of that same year, several other GMP-inspection related changes were proposed by the Chinese Ministry of Health, which included establishing a process by which CFDA can more easily refuse, suspend, or revoke a manufacturer’s GMP certification by adopting a risk-based approach during inspections; expanding the circumstances under which CFDA can take enforcement actions and establish timelines for GMP certification; and proposing GMP inspections every two years during the five year time period that the GMP Certificates are valid. In the beginning of 2017, CFDA also announced plans to replace current GMP certification of every 5 years by a dynamic unannounced inspection system. These policy moves are intended to bring China’s GMP code in-line with that of European Union (EU) and US codes and regulations. Analysts believe that such reforms by regulatory authorities will improve manufacturing practice as well as bring a better overall quality image of made-in-China biopharmaceuticals, which in turn will help with potential exports of GMP products. China is also focusing on developing its innovative pipeline and ramping up its clinical trials activities in regulated markets. Clearly, the industry’s ambition is to establish GMP exports. In a recent BioPlan survey of 50 Chinese members of its Biotechnology Industry Council™ (BIC) panel of bio-processing experts, we evaluated how and when China biopharma companies plan to fill the gap and become a global hub for bio-processing. Domestic manufacturers show ambition of becoming a global bio-pharma manufacturer over the next decades. While they do recognise clear gaps between their capabilities and the capabilities necessary to become a global player, nearly 90 per cent of responding Chinese biologics managers indicated their company currently plans to target global distribution of GMP produced biologics within 10 years. Study respondents also identified top ‘strength’ attributes most important to China, if it is to expand its presence in global biopharmaceuticals. A total of 58 per cent cited the Chinese biologics industry as requiring more innovative biopharmaceutical pipelines (Figure 2). While we see the concern relates directly to China’s limited R&D investments, especially insufficient investment in early stage research on products and platforms, there are signs of improvements in pipeline development in recent years. 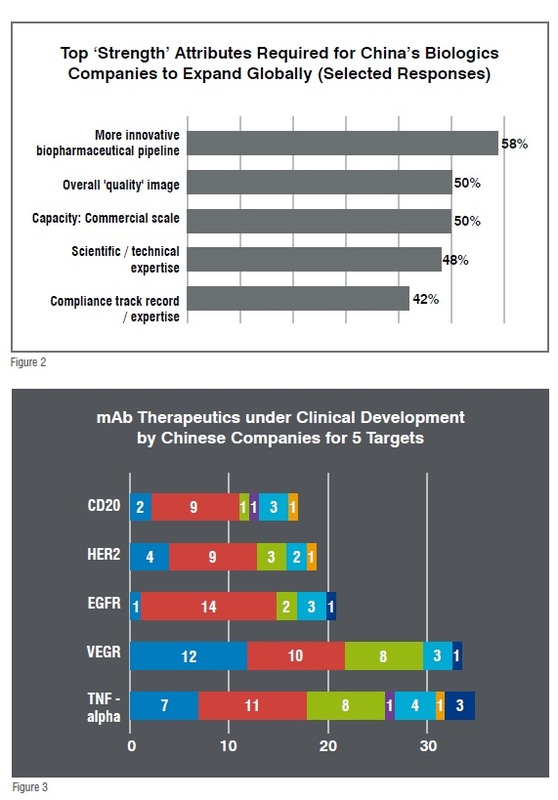 In 2016 alone, CFDA publicised close to 200 new biological entering clinical trials in China and altogether, and Bioplan’s own study shows that over 170 mAb therapeutics are under clinical development in China, with CD20, HER2, EGFR, VEGF, TNF-alpha as the hottest targets (Figure 3). The most ambitious Chinese companies are already conducting clinical trials in regulated markets. For example, Genor Biopharma has started phase I clinical study of its anti-Her2 mAb in Australia, and Teruisi, an antibody therapeutics company founded by returnee scientists, is also going to apply for IND for one of its projects in US this year. We expect to see a more robust biological pipeline from Chinese companies in the near future. Biologics CMO businesses are also growing quickly due to strong domestic and global market needs. Though China currently does not export finished biological therapeutics to regulated markets, domestic contract manufacturing companies are already attracting business from global clients. WuXi Biologics, winner of Asia-Pacific Bio-processing Excellence Awards 2017 from IMAPAC, worked with TESARO, the Waltham, MA based bio-pharmaceutical company on Anti-TIM-3 Antibody, whose IND application to FDA was submitted in 2016. The company also completed construction of Asia’s largest perfusion biologics manufacturing facility using disposable bioreactors in 2016. The new facility “will uphold the highest quality standards to expedite global development of biologics for both international and domestic clients”, as announced by Dr. Li Ge, CEO and Chairman of the company. JHL Biotech, another important biologics CMO in China, has announced strategic biologic alliance with Sanofi. The company also partners up with Singapore-based ASLAN for manufacturing services of the latter’s ASLAN004, a fully human monoclonal antibody that blocks the signaling of the IL-4 and IL-13 receptors. The Chinese biopharmaceutical industry is actively investing in both the biologics pipeline for innovative domestic products, and the bio-manufacturing infrastructure needed to commercialise these innovations. 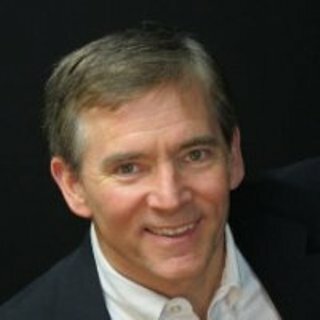 While our studies find that the industry is focusing first on its domestic markets and exports to lesser-regulated markets, the improvement in its quality management systems, a regulatory system more aligned with US/EU standard, a more robust pipeline at clinical stages, as well as adoption of advanced bio-processing technologies, will likely lead to a more significant global position in biologics in the future. 1. Top 60 Biopharmaceutical Facilities in China, BioPlan Associates, Inc., Rockville, MD USA, March2017. 2. China’s Advances in Global Biopharma and Bioprocessing: A 10-year projection in need for innovation and quality improvements; January 2017, White Paper Survey of 50 Chinese Biopharmaceutical Executives, BioPlan Associates, Inc. Rockville MD, www.bioplanassociates.com. Vicky Qing XIA, Project Director, BioPlan Associates has her MS in biology from University of Texas-Houston, MBA from University of Pittsburgh. 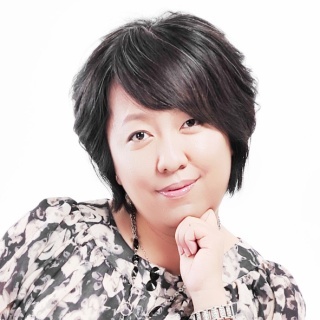 She has experience in consulting, business development, as well as alliance management in China’s bio-pharmaceutical industry. Her expertise includes developing research and analysis on multiple global market segments, and has managed a team of industry experts, and projects. Leo Cai Yang, Project Manager, BioPlan Associates, has business development experience in biotech and pharma segments and 10 years in market research. 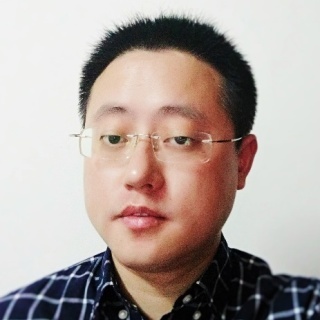 He graduated from East China Normal University with a bachelor’s degree in Biotechnology in 2006, and has worked with equipment manufacturers in pharmaceutical and medical device industries, in Switzerland, Austria and Germany. He has also project managed studies involving new biopharmaceutical technology applications in China including analysis and strategy development.